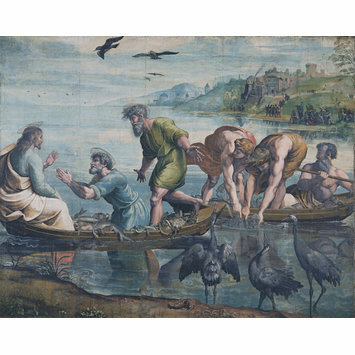 The Raphael cartoons are designs for tapestries and were commissioned from Raphael by Pope Leo X (1513-21) in 1515. The tapestries were intended to hang in the Sistine Chapel in Rome, built by one of Leo's predecessors Pope Sixtus IV (1471-84). The Chapel was primarily intended for the use of the Pope and the Papal chapel, the body of clergy and Laity immediately surrounding him. The decoration of the chapel under Sixtus dealt largely with the theme of the Pope's authority. The tapestries continued this theme, illustrating scenes from the lives of St. Peter and St. Paul who were seen as the founders of the Christian Church, and the sources of the Pope's authority and power. They had in addition woven borders showing scenes from Leo's life, also designed by Raphael: the cartoons for these have not survived. In this cartoon Christ tells Peter to cast his net into the water whereupon he and his fellow apostles make a miraculous catch. 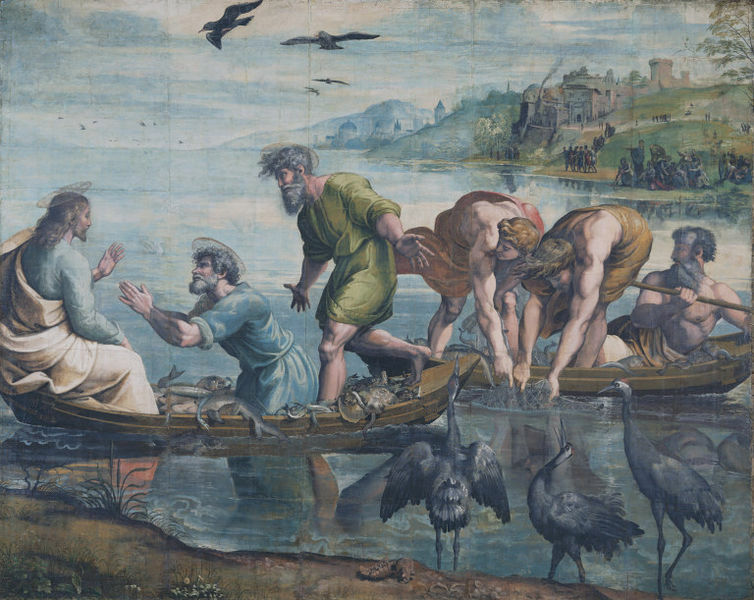 The story refers to Peter's role as "fisher of men", who converts others to Christianity. It also demonstrates his humility as he kneels before Christ to acknowledge His divinity, and confess his own sinfulness. For further information on the Raphael Tapestry Cartoons please see the V&A website under : Collections, Paintings & Drawings, Paintings & Drawings Features, Raphael Cartoons.